The world of Guts, the Black Swordsman, is changing in a hurry. Though a demonic maelstrom has leveled the dreaded Tower of Conviction and ended the reign of terror of its grand inquisitor, Mozgus, peace has not returned to Midland. 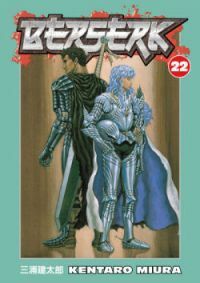 The Tower's fall has heralded the unexpected return of Griffith, Guts's former leader, last seen transformed from a shattered husk into one of the demon lords of the Godhand. But Griffith looks like his old self again-and with his dreams of carving out a kingdom by his own hand still intact. He's raising a new Band of the Hawk, but this time he's recruiting from the dark side to fulfill his deadly destiny!